From secret passageways to haunted green rooms, we’re giving fans an insider look into some of the coolest venues around. Welcome to the Bandsintown Venue Spotlight! Right in the middle of N. 11th and 12th streets, Brooklyn Bowl is located in the heart of Williamsburg, Brooklyn. Once you step inside, you're greeted with bright neon lights shining over musical memorabilia, the smell of mouth-watering comfort foods, the sound of fans singing along to the live band performing, and strikes being made left and right with the slam of bowling balls into pins. With a 16-lane alley on one end, and a 600-person capacity music hall on the other, there is nothing ordinary about this place. When it opened in the summer of 2009, Brooklyn Bowl immediately made a name for itself because of its unique combination of live music, incredible food, and of course, the gigantic bowling alley. The BK Bowl has hosted performances by in 2014, The Roots in 2015, and Lauryn Hill in 2016, so we just had to get a closer look inside this well-known, vivacious venue. In addition to their venue in Williamsburg, Brooklyn Bowl also has branches in Las Vegas and London, which are just as awesome. We had the opportunity to interview Brooklyn Bowl’s head talent booker, Lucas Sacks, to ask him all about what goes on behind the curtains, how many artists have bowled in the alley, and the hidden facts about this hot spot. When did you know you wanted to be involved in this business and how did you get started? Since playing in a band and working in a recording studio in high school, I knew I wanted to work in the music business. I went to college for Music Business and interned at venues, management firms, and with promoters around NY & elsewhere including Soulive's then management company. That connection brought me to Brooklyn Bowl since they've played here more than any other band has, and I've been here ever since. If you were talking to someone who had never heard of Brooklyn Bowl, how would you describe it? Brooklyn Bowl feels like an a-la-carte menu. Since we have live music, a restaurant, bar, and bowling, guests can do as much or little of each activity as they want, tailoring their experience how they choose. It always feels like a party at Brooklyn Bowl and guests pick up on that right away. What is a fun fact about the BK Bowl or something that fans who attend the shows don’t know? We're a much smaller staff of long-time employees than people may think. We all live and breathe the ethos of the room and work hard to provide unique and interesting programming for anyone to enjoy. 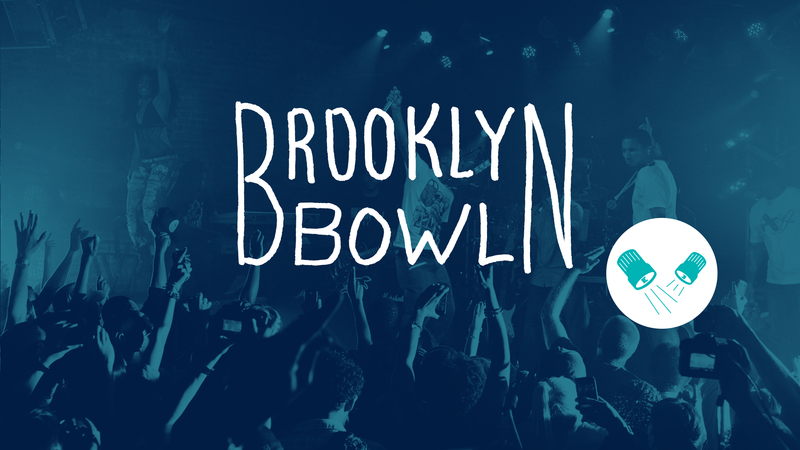 Brooklyn Bowl hosts a variety of special events, which one is your favorite and why? I love our 2-3 night runs with bands and seeing how the live shows evolve and change each night. I also really enjoy our Governors Ball Festival After Parties because the energy for these late night shows is amazing and we always try to one-up ourselves each year with bigger and bigger acts from the festival proper. New Year's Eve is also a massive party and filled with a lot our year-round regulars who make it a great time. Do the bands or artists ever bowl before or after a show? If so, have you ever had the chance of actually bowling with a band or artist that played a show at the Brooklyn Bowl? Yes! Many of the bands who regularly perform here year after year look forward to eating and bowling every time they play the room. I'm often running around making sure everyone is happy and everything is going well to bowl with the bands and would rather they enjoy. The show and the hang is what makes it for me. What’s the best part about being located in the heart of Williamsburg, Brooklyn? Williamsburg is ever-changing and evolving. It's such a high-traffic area of different types of people that we're able to create regulars out of newcomers. It's also great to see many of the local businesses become neighborhood staples over the past several years. We all know each other and everyone is very supportive. Which performance has been your favorite and why? I was particularly drawn to Elvis Costello and The Roots because I love both acts separately & and it was the first US show since they'd released their record together. They played the whole record as well as some songs from each of their catalogs, so it was like seeing 3 separate shows in one night. Who was the first act you booked at BK Bowl? What attracted them to you? French Horn Rebellion was the first act I booked on my own back in 2012. As a young and eager Assistant Buyer, I had just been tasked with our late-night weekend slots and together with the band, we created a 4-month residency of late shows with special guests like Nancy Whang (LCD Soundsystem), and Jody Watley. I love their vibe, how easy they are to work with, and how open they are to collaborating and developing something unique. Some of Our Favorite Tweets @brooklynbowl This Year!